I must say this month has been action packed for me. I kept myself busy in various activities and learnt few good & new things. I think this is the mantra of happiness- keep yourself busy and learn something new. 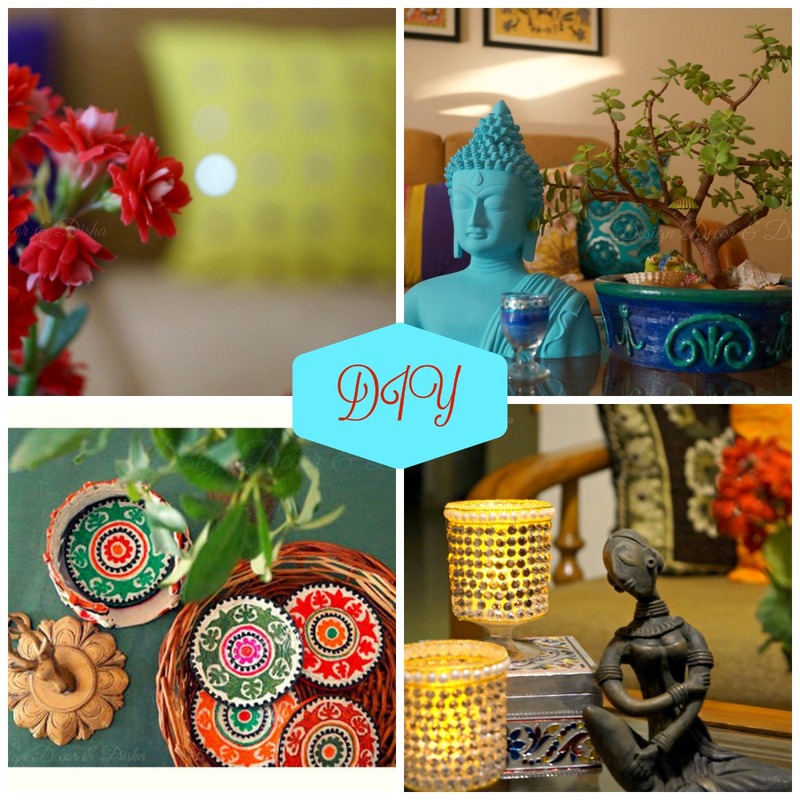 I have always been a great admirer of all Indian art forms . It was my dream to explore and learn about various Indian Arts and that's what I am doing these days. Let me share my happiness with you all wonderful people who always keep encouraging me by reading, commenting and liking my every post. 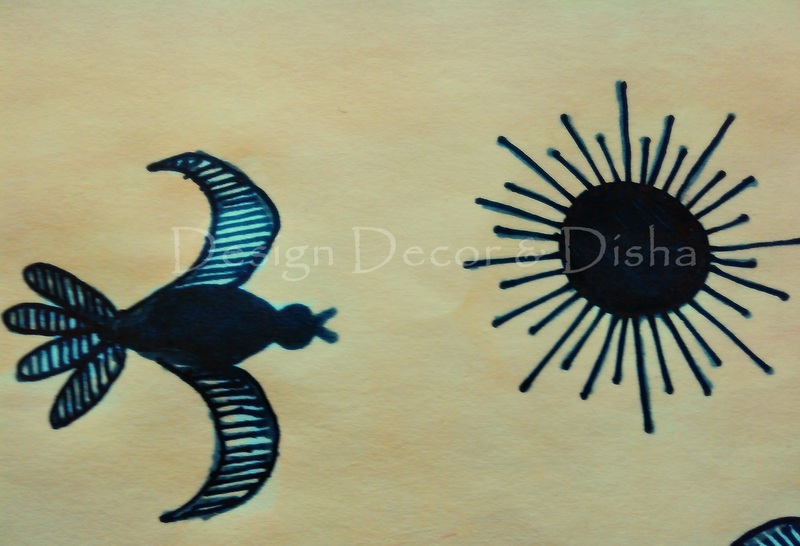 Recently I learnt about 'Warli Art' and found that it's not only the simplest art form but looks magical too. 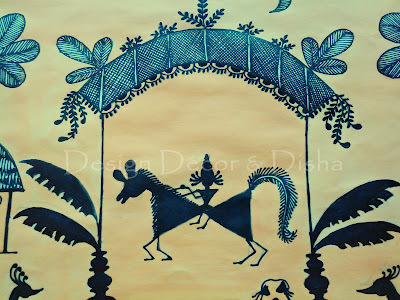 Earlier I had done Warli art only on a small pot but this time I tried it on paper with all the details and tried to depict social life of Warli tribes. 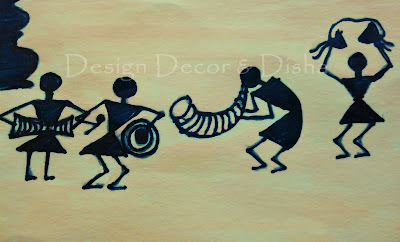 Here is my first Warli painting. Theme is wedding. Here are the details. Sun and sparrow can be of same size in this style of painting, as proportionality doesn't matter. Groom on a horse arriving for wedding. Banana leaves, earthen pots and decoration with flowers and leaves to recreate the scene of wedding ceremony in a village. People are welcoming groom and playing instruments. All the shapes are geometrical circle for head, triangles for trunk and pelvis of human body. Faces are bereft of features. Palm trees and hut to recreate a village scene. Again geometrical shapes are used and filled them with fine lines as no free space should be left in this style of painting. Animals and birds are very common in this painting. 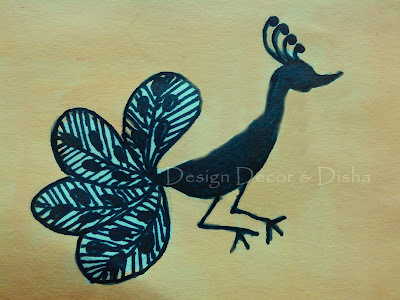 Here is my Warli peacock. You did achieve :) it turned out fabulous. Thanks Nayana for appreciating it!! SO detailed Disha. Really beautiful work. I have tried Warli once too. It is really an amazing art form. Saw yours. Beautiful work Reema thanks for sharing. Loved it totally!! really beautiful scene Disha! 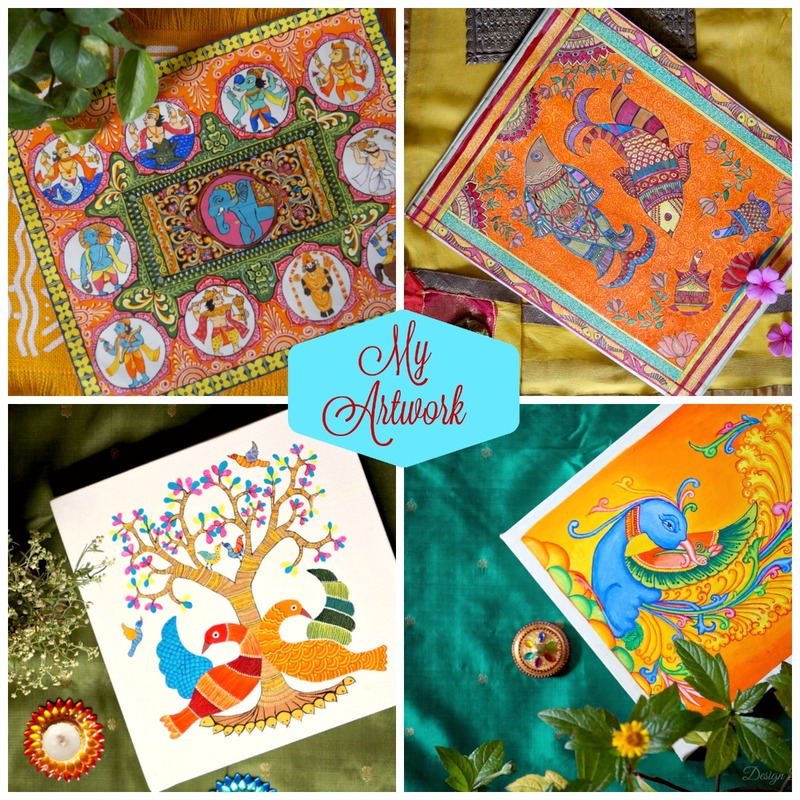 I really enjoy reading about the various Indian art forms you have been sharing and painting so well yourself. Thanks Linda, stay tuned lot more to come. Oh Ritu its coming from you. I am honoured! Thanks a lot. 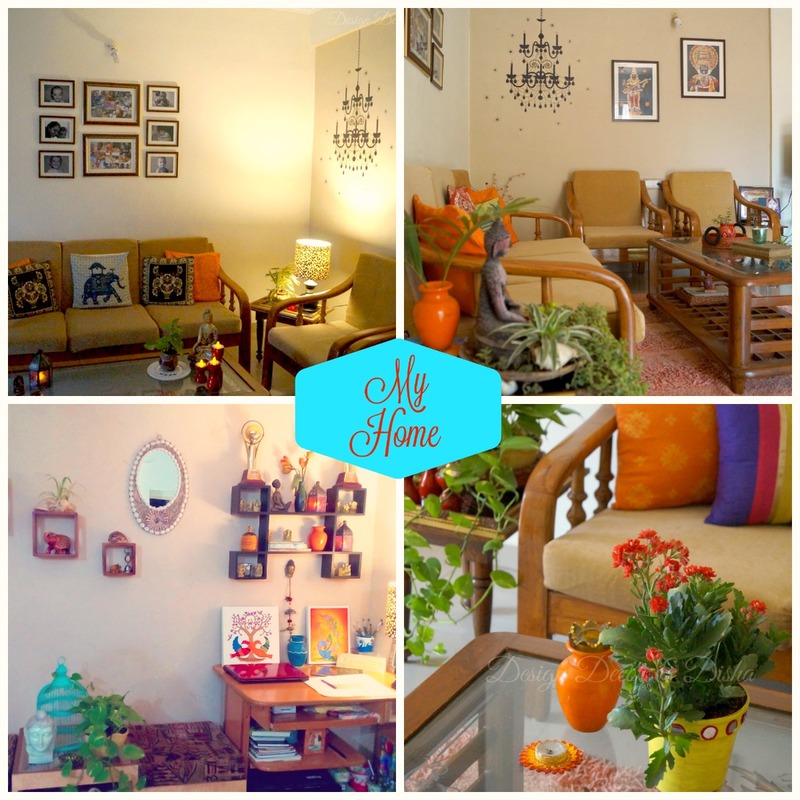 I love your work Disha, so glad to find my way to your blog. Im so much in love with India after living in Kerala for many years ago. Thanks for sharing. Thanks for appreciating my efforts. I am happy to know that lot of people love to know more about Indian Art, culture and heritage. It turned out fantastic! I love all the line work detailing. My daughter would love this as she her fiance is Indian and she is learning about their culture and loves everything about it. Thanks a lot Deanna. That's wonderful. Convey my wishes to your daughter and let her enjoy learning all about new culture. India is very rich in culture and heritage. Thank you Netty. I am so happy that you liked it. I am not familiar with this art form so in learning and painting you've also taught me. I think it turned out beautifully! I like the black lines/designs that fill in each shape. happy PPF! That a wonderful compliment Dianne. I am glad that you learnt this art form. Thank you. What a wonderful artform, I just love this! HPPF! Very pretty work....has a feel like zentangles! Thanks Giggles!! Though it's very different from Tangles but it certainly has a feel of Tangle art. 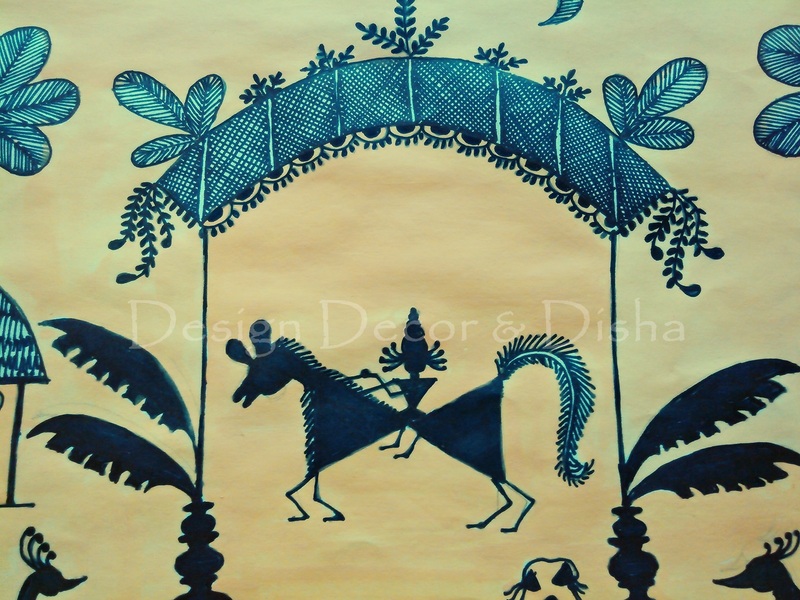 great depiction of the traditional art Disha. 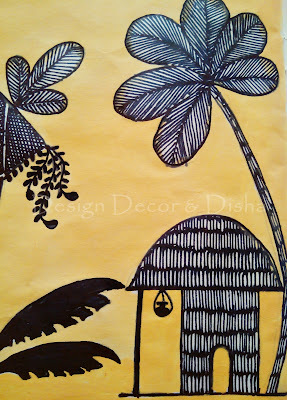 My favorite is the palm tree and the hut. Thanks Susan!! I am glad that you loved my painting. Thanks for dropping by. This is absolutely stunning. Well done.